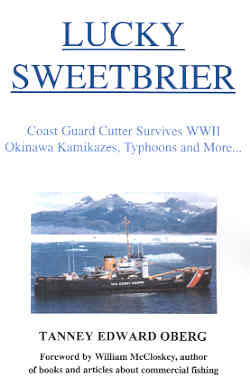 The Coast Guard cutter Sweetbrier first encountered combat late in World War II during the Battle of Okinawa on May 6, 1945, when the ship fired its guns to help shoot down a diving kamikaze plane. This 180-ft. cutter primarily installed and maintained marking buoys, critical for success of amphibious operations, but the ship also frequently used its anti-aircraft gun and other guns to shoot at incoming Japanese planes over the next two months. Tanney Edward Oberg, senior radioman on Sweetbrier from her commissioning in July 1944 to November 1945, wrote this short wartime history of the ship. Although the author presents battle details in a rather tedious manner, the book's personal stories colorfully portray strengths and quirks of the ship's 7 officers and 74 enlisted men. Although the Sweetbrier crew witnessed several kamikaze attacks and participated jointly with other ships in shooting down a few kamikaze planes, the cutter never suffered any hit. The author gives few details on kamikaze attacks observed by the ship, and he provides no facts on kamikaze attacks in general during the Battle of Okinawa. The most interesting kamikaze attack observed by Sweetbrier's lookouts was a seaplane that landed in darkness near the American fleet and then in the early morning took off and dove into a ship at anchor. In an attack on May 20, 1945, when Sweetbrier was off the southern coast of Ie Shima (small island northwest of Okinawa), the ship's crew witnessed a kamikaze plane hit the USS LST-808, a landing ship for tanks. The LST-808 was resting on the reef at Ie Shima after having been damaged by a torpedo just two days before. Despite fires caused by the kamikaze crash, only one man was injured in the attack since most of the LST-808's salvage crew had gone ashore. The book's most interesting parts have nothing to do with kamikaze attacks. In two chapters Oberg provides a sensitive account of the alcoholism of the ship's captain, the chief executive officer, and doctor. He explains how the captain had to be relieved of command, but it happened in such a way that he did not lose his dignity or the respect of his men. The book also mentions instances of racism against African Americans, but the author writes that they earned the respect of other men on the ship for their excellent job performance. Other interesting sections include the ship's experiences with typhoons and the October 2001 ceremony to transfer the ship to the Navy of Ghana after her decommissioning by the U.S. Coast Guard in August 2001. The first half of the book follows a chronological order, but the last half jumps around to various topics. Near the end of the book, Oberg devotes two chapters each to the histories at Okinawa of the LST-808 and the battleship Pennsylvania. The number of pages devoted to these ships seems excessive, since part of the LST-808's story is covered in the book's first half and since Sweetbrier had no relationship to the Pennsylvania other than about one hour of unsuccessful salvage work after the battleship had been hit by a torpedo. The book would read more smoothly if the author had incorporated stories and data in the last half of the book into the chronological order used in the first half. A couple of other drawbacks in the book include no maps and at times the overuse of long quotations from official war diaries rather than incorporating these dry recitations of facts into an easy-to-read narrative. Lucky Sweetbrier has some interesting personal stories and shows how the small ship faced the kamikaze threat during the Battle of Okinawa. However, lack of details on Japanese air attacks and Sweetbrier's relatively little direct involvement with these attacks make this book of limited worth to those interested in Japan's kamikaze.